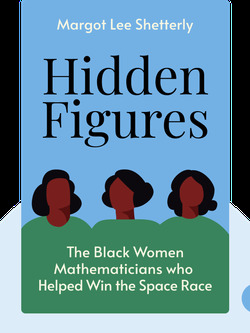 The story of black women mathematicians at Langley began in the 1940s. Neil Armstrong didn’t fly to the moon and back on his own. There were many people hard at work behind the scenes, most of whom haven’t had their stories told until now. Before it became the National Aeronautics and Space Agency in 1958, NASA was known as NACA, or the National Advisory Committee for Aeronautics, and its research headquarters were located at the Langley Memorial Aeronautical Laboratory, in Hampton, Virginia. NACA, founded in 1917, was originally a place where warplanes and other kinds of machines for flight were developed. This all changed during the Cold War with the Soviet Union when NACA turned into NASA and devoted itself to winning the space race. In the 1940s, Langley hired its first black employees as “computers,” since they would be performing mathematical computations. Prior to the forties, racial discrimination prevented these jobs from being accessible to black people. But this changed thanks in part to pioneering civil-rights activists like A. Philip Randolph, who threatened to send 100,000 protesters to march on the capitol to bring discrimination to national attention. So, in 1941, President Franklin D. Roosevelt issued Executive Order 8802, which desegregated the defence industry, and Executive Order 9346, which created the Fair Employment Practices Committee. While these orders allowed black women to work at Langley, it was still a segregated workplace. In fact, the first group of black women there were known as the “West Computers,” since they all worked on the west side of Langley’s campus, separate from the white employees. Nonetheless, they were still at the heart of Langley’s operations, and their story is a vital part in key twentieth-century developments like World War II, the Cold War and the space race, as well as the civil rights movement and the transition to electronic computing. Some of these women have been duly recognized, such as Katherine Johnson, who was given the highest civilian honor, the Presidential Medal of Freedom, in 2015. Yet the majority of the world is still unaware that there was a team of all-black, all-female math whizzes helping the United States explore space. World War II helped open the door for the trailblazing West Computers. In the face of discrimination, the West Computers displayed bravery and resilience. The West Computers helped pave the way for both racial and gender equality at Langley. Langley wasn’t just a science and engineering lab; it was also a laboratory for race and gender relations. Start your free Blinkist trial to get unlimited access to key ideas from Hidden Figures and over 3,000 other nonfiction titles. With bitesize text and audio, it's easier than ever to find the right ideas to transform your life.